Fri, 5 August 2016, 12:00 St. Mary’s University College, Falls Road, Belfast. 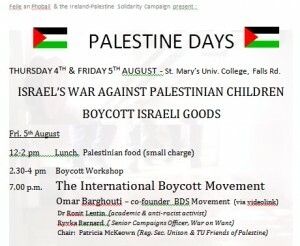 As part of the annual Felie An Phobail, the Ireland-Palestine Solidarity Campaign (IPSC) present two days of events in solidarity with the Palestinian people. All events are FREE and there will be stalls and exhibitions throughout the day. St. Mary’s University College, Falls Road, Belfast. A selection of delicious homemade Palestinian food. There will be a small charge to cover costs. A workshop looking at how to take part in the Boycott Israeli Goods movement.